Learn about Arduino SD card data logging using an LM35 temperature sensor and a DS3231 module. In this article, you are going to learn about Arduino SD card data logging. We will use the LM35 temperature sensor to get the temperature value, and the DS3231 module to get the time and date. Then we will use the SD card module to open the SD card, and we will enter the date, time, and temperature in the SD card file. First of all, connect the SD card module to the Arduino. The SD card module works with the Arduino through the SPI communication. The SPI pins on the Arduino are pins 10, 11, 12, and 13. After that, connect the DS3231 module with the Arduino. The DS3231 module works with the Arduino through the I2C communication. The pins for I2C communication on the Arduino are SDA and SCL. In the end, connect the LM35 sensor with the Arduino. 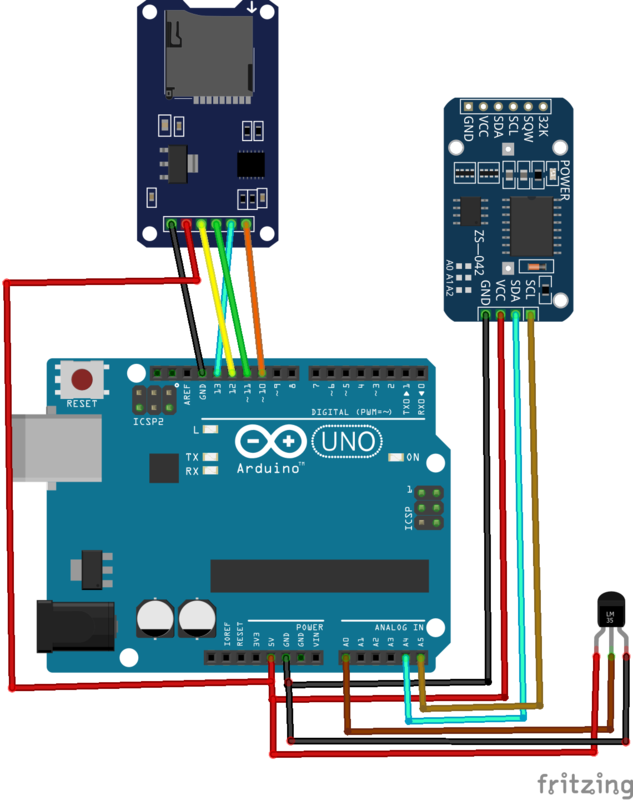 Connect the left pin of LM35 to 5V of Arduino, middle pin to A0 of Arduino, and the left pin to ground of the Arduino. First, include the libraries for the SD card and for the DS3231 RTC module. The SD card works with the Arduino through the SPI communication, so we have included the SPI library. Then we initialize an object “sdcard_file” of type File, which will help us use the functions of the library. After that, we define the pins where we have connected the CS pin of SD card module and the lm35 sensor pin. Next we declare the CS pin as output and the LM35 sensor pin as our input. Then we start the serial communication and communication with the RTC module. After that, we check if the SD card is correctly initialized or not. If the SD card is initialized correctly, then "SD card is ready to use" is printed on the serial monitor. Next we print the “Date”, “Time”, and “Temp” on the serial monitor. Then we open the SD card file and print the same thing there. If the file that we named is not there, it will be created there. After printing there, we close the SD card so that the data in the file gets saved. In the loop function, we read from the LM35 sensor and calculate the output. Then we print the current date, current time, and current temp on the serial monitor. After that, we open the SD card file again and print the current date, current time, and current temp. You should now have a functioning data logger that uses an Arduino to keep track of the time, date, and temperature around your sensor. What would you add to this project? Fork it and develop your own version.